Time has run out for the embattled community aboard the cruise ship Spirit of Arcadia. Their options for survival have dwindled, leaving only one viable course of action. With their outlook bleak, civil unrest threatens to destroy everything they’ve worked for. Yet all hope is not lost. One among them could hold the secret to a brighter future. What doesn’t kill you makes you stronger, or so the saying goes. Having lurched from one calamity to another, Captain Jake Noah and his end-of-the-world companions should be tough enough to face anything. But the community has been beaten down by its constant battles against death, and is in danger of imploding. A last glimmer of hope lies with a young man from a land far away. Does he hold the secret to the future of the fleet? Jake thinks so, but the choices he makes now will spark the most frightening challenges of his life, as forces both inside and outside the ship conspire to try and defeat him. 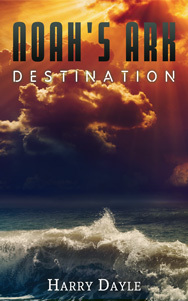 Destination is the fifth and final novel in the thrilling Noah’s Ark series, a post-apocalyptic contemporary sea adventure. *eBook Edition. International prices may vary due to local taxes.